Car Rental Des Moines Airport (DSM) - Easy Bookings ! Van rentals, convertibles, luxury cars, SUVs and sports cars are some of the most popular & highly rented categories at the Des Moines International Airport. Rent a car for Des Moines International Airport in just three quick steps - search, compare, reserve! Cancel your Des Moines International Airport car rental for free, up to 48 hours before the pickup time. If you are looking for the right place to rent a car at Des Moines Airport (DSM) that provides top-class facility at affordable rates, USA Cars rental is what you need! Safe, comfortable and completely reliable, with on-time services that will never let you down. Select a car from a wide range of cars and book with the leading suppliers. Use our simple booking engine to rent a car in three simple steps viz search select and rent. Des Moines International Airport – Highlights! The Des Moines International Airport, now owned by the city of Des Moines, was originally overseen by the City of Des Moines’ Parks Department. The airport terminal is divided into two concourses, i.e. concourse A with gates A1-A5 and concourse C, with gates C1-C7. There is a renovation project that includes a new paint job and ceiling, gate counters, new carpeting, seating, and a sprinkler system designed to turn on during a fire. An additional feature is the introduction of a general use project that allows all airlines to access any of the gates at this airport. Concourse C is said to be installed with a brand new restroom. Additionally, the baggage handling zones are to be upgraded and modernized for easier access. Along with car rental facilities, the Des Moines plans to come out with better parking facilities along with as a massive 5,000 plus foot runway. The airport has a cell phone waiting counter, Wi-Fi facility throughout its terminals, food courts with a grab and go facility and a full service restaurant equipped with a fully stocked bar. A gift store called Capital News & Gifts is located in the lobby level of the terminal and offers traditional gifts, merchandise, a newsstand as well as traveler conveniences. The most popular restaurant in Des Moines. A great place to enjoy bakery items in Des Moines. 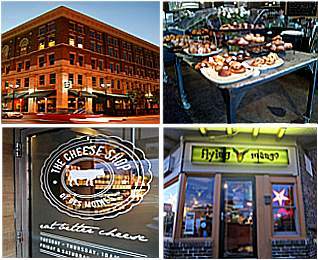 Explore the world of cheese here. A restaurant and catering service in Des Moines. A restaurant, bar and pub rolled into one.